Rainbow Weave Shoelaces for Chucks. Give your chucks a bright new look with these rainbow weave flat athletic laces. Choose the 54 inch length for the standard eight eyelet high top. Select the 45 inch length for seven eyelet lowcut chucks or smaller sized chuck high tops with seven eyelets. Choose the 63 inch length for shoes with nine eyelets. The laces are 3/8 inches wide. To see how rainbow shoelaces look on various pairs of chucks, go to the Photo Gallery of Neon Shoelaces. Alternate Rainbow Pattern Shoelaces for Chucks. These are currently only available in 45 inch lengths. 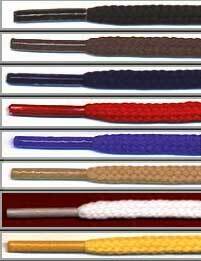 Red, White, and Blue Weave Shoelaces for Chucks. These red, white, and blue shoelaces in a patriotic weave are designed for chucks with seven (45 inch), eight (54 inch), or nine (63 inch) eyelet pairs. Red, white, and blue shoelaces are also available in a extra-fat print style. (available on the Print Shoelaces Page) To see how these shoelaces look on various pairs of chucks go to the Photo Gallery of Red, White, and Blue Shoelaces for Chucks. Narrow Round Shoelaces for Chucks. If you want to lace up your chucks with thinner looking laces, narrow round laces are for you. Their solid design gives them great strength, even though they are smaller in width than standard shoelaces. 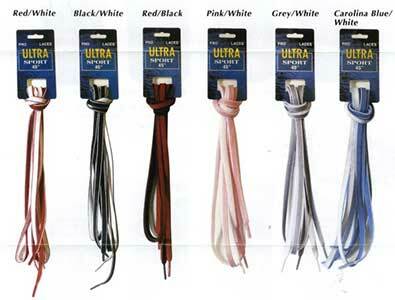 Many new models of athletic shoes now come with this style of shoelace. These 54 inch round narrow width shoelaces for Chuck Taylor high tops with eight eyelets are available in eight colors. They can be used with low cut models also. To see how narrow round shoelaces look on various pairs of chucks, go to the Narrow Round Shoelaces on Chucks Photo Gallery. 45 Inch Reversible Laces for Chucks. These shoelaces come in two colors, one on each side so you can lace up in two colors or one basic color with trim. Six cool color combinations are available. These 45 inch shoelaces are meant for Chuck Taylor seven eyelet shoes.To see how red/white, black/white, black/red, pink/white, grey/white, or Carolina blue/white reversible shoelaces look on various pairs of chucks, go to the Reversible Shoelaces for Chucks Gallery. Add 45 Inch Red/White to Cart. Add 45 Inch Black/White to Cart. Add 45 Inch Black/Red to Cart. Add 45 Inch Pink/White to Cart. Add 45 Inch Grey/White to Cart. Add 45 Inch Carolina Blue/White to Cart. 54 Inch Reversible Laces for Chucks. These shoelaces come in two colors, one on each side so you can lace up in two colors or one basic color with trim. Six cool color combinations are available. These 54 inch shoelaces are meant for Chuck Taylor eight eyelet pair shoes. 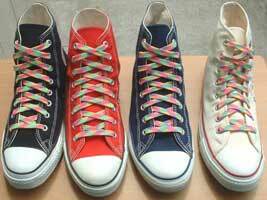 To see how red/white, black/white, black/red, pink/white, grey/white, or Carolina blue/white reversible shoelaces look on various pairs of chucks, go to the Reversible Shoelaces for Chucks Gallery. Add 54 Inch Red/White to Cart. Add 54 Inch Black/White to Cart. Add 54 Inch Black/Red to Cart. Add 54 Inch Pink/White to Cart. Add 54 Inch Grey/White to Cart. Add 54 Inch Carolina Blue/White to Cart.